UPDATE: Since Faeit has unfortunately been shut down, try 3++ for the most recent Eldar news. 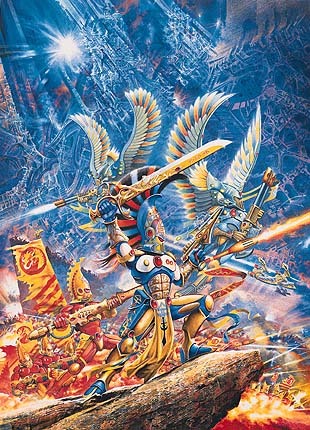 This is one of the first images I can recall seeing before I knew anything about Warhammer 40k, but one that got me interested and asking questions. It's an army that has always been on the "would like to have one" list. 6th edition allies have made that proposition even better as I can start small with just a detachment for my Dark Eldar and begin using them right away as I collect them. These rumors have me thinking beyond a mere allied detachment and even if only half of them pan out, I can easily see them being my next longterm project. We'll just have to wait and see what new things come out for Eldar in the next few months. Plus now I'm inclined to save all my moneys for these new space elves; they sound like they are going to be awesome! Personally, I'm really hoping they expand on possible synergies with the Dark Eldar, like allowing both armies to use those new Webway Gates, etc. Hey Joe...I saw recently that you were dismantling the Raven Guard...I had a sad face. However, if you'd move some of the bikes for some eldar we may be able to make a deal. I'm mostly interested in what the new sculpts for Eldar will look like. I hope they get the Dark Eldar treatment -- their old stuff was mostly terrible but the new range is fantastic, and Eldar deserve a sleek new facelift for their models as well.